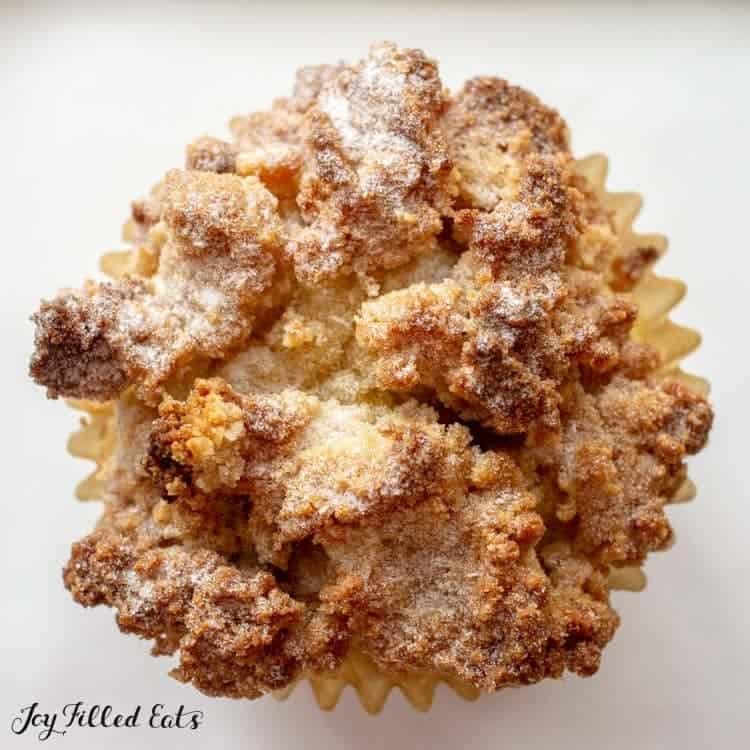 Coffee Cake Muffins are a delicious breakfast dessert or afternoon snack. They pair perfectly with, you guessed it, a cup of coffee! But even if tea is more your thing these will tickle your taste buds with sweet cinnamon and buttery crumbs. I have a bunch of crumb cake recipes here at Joy Filled Eats. An Almond Crumb Cake, a Blackberry Coffee Cake, and a Cranberry Cake with Walnut Crumb Topping. One thing that is always a must is that a Coffee Cake with Crumb Topping has a lot of crumb topping. That is the best part. 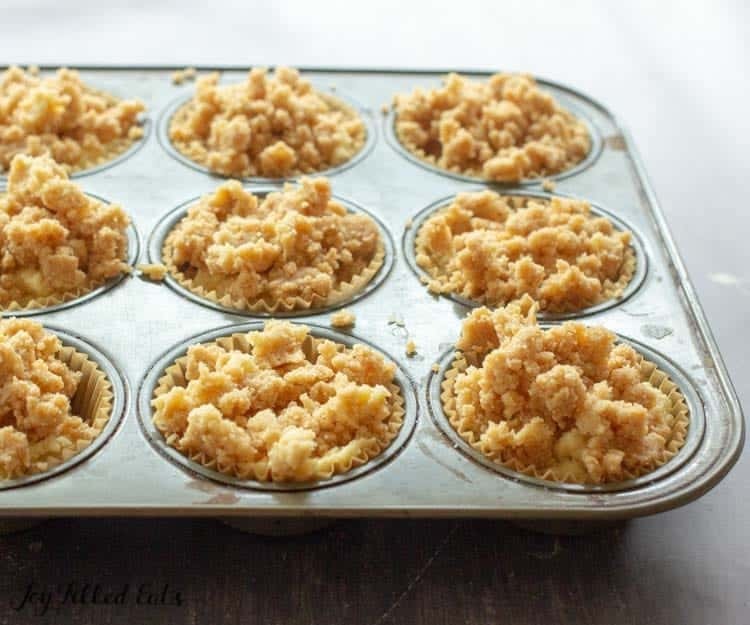 They are all delicious but there is something special about individual Coffee Cake Muffins piled with buttery, cinnamon crumbs. This past weekend I was blessed to be able to go on a women’s retreat. I go every fall and I love it. Gatherings like this are a perfect opportunity to share some of the baked goods that tend to take over my kitchen. 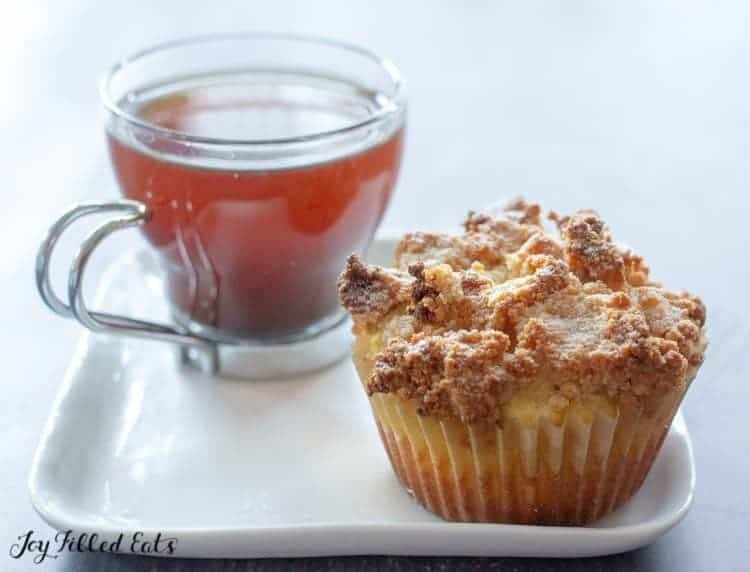 Saturday morning I put my plastic storage container of these Coffee Cake Muffins on the breakfast table, simply labeled ‘Gluten Free Cinnamon Muffins’ and went to my seat. When I went to pick up my container later it was empty and I had a bunch of women come up to me asking for the recipe. Sometimes I’m not sure if a recipe is good enough to share here so I love to have test testers outside of my own family. My women’s group frequently doubles as recipe guinea pigs. And they do give constructive criticism. I’ve been told cupcakes were too dry before. I was not offended and sent that recipe back to the kitchen for more testing before sharing it. Anytime I make a coffee cake my kids are always in disbelief it doesn’t actually have coffee. My coffee loving 9-year-old is bummed and the rest of the kids are relieved. Coffee cake is a general term for a breakfast cake that goes well with coffee. Many are crumb topped but not all of them. Some are cinnamony bundt cakes with glaze or lemon and blueberry loaf cakes. You can group almost any morning sweet under the term ‘coffee cake’. But the most traditional is a yellow cake topped with buttery crumbs and powdered sugar. 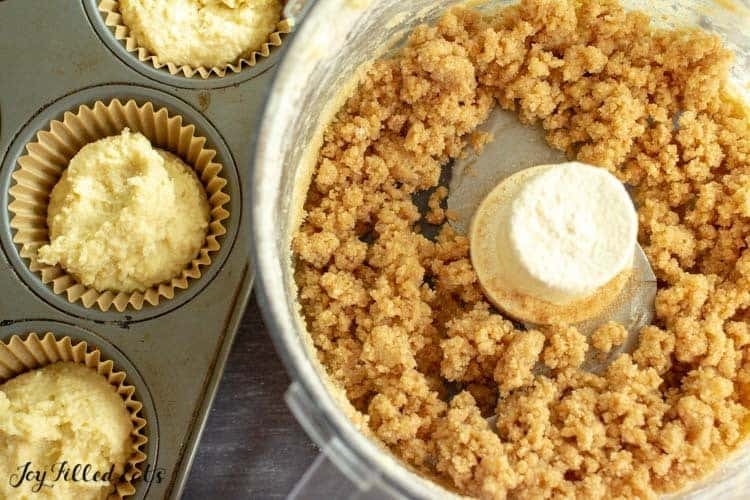 Like most of my recipes, I strive to keep my coffee cake muffins easy. I make the batter in the food processor, put that into the muffin cups, and then make the crumbs in the same food processor without even washing it. As long as you scrape out the batter well with a rubber spatula you can skip the washing step. The ingredients to both the batter and crumb topping are similar enough that it doesn’t matter if it a little batter gets mixed into the crumb topping. As I said I make my crumb topping in the food processor. 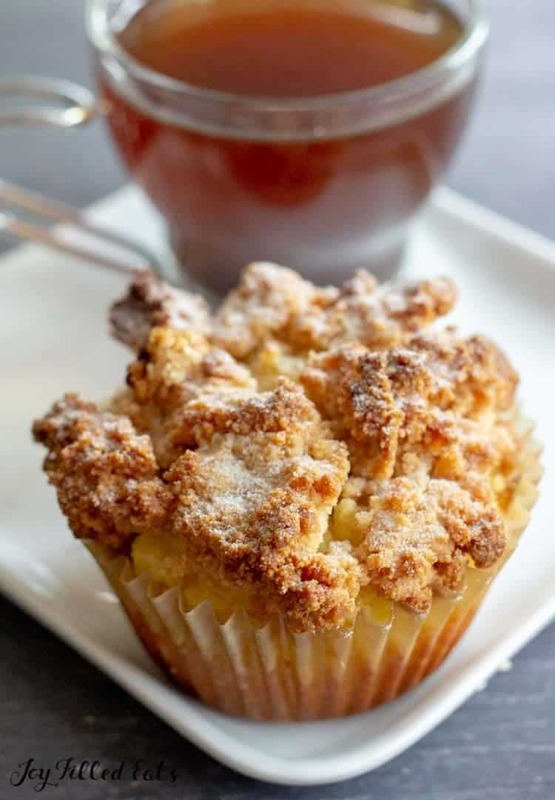 By pulsing together butter, sweetener, almond flour, coconut flour, and cinnamon you get big, wet crumbs that are perfect to top these coffee cake muffins or any other coffee cake treat you can dream up. It can be! I keep my coffee cake healthy by using almond flour and coconut flour instead of white flour and by replacing the sugar with a stevia blend sweetener. This reduces the sugar and carbs to almost nothing. I sprinkled these with a little bit of powdered sweetener just to make them prettier but that is not mandatory. You could also add nuts into the topping or berries into the batter. Are you longing for a cream cheese filling? Put a little cube of cream cheese right into the center of the batter. All of these variations would be delicious. 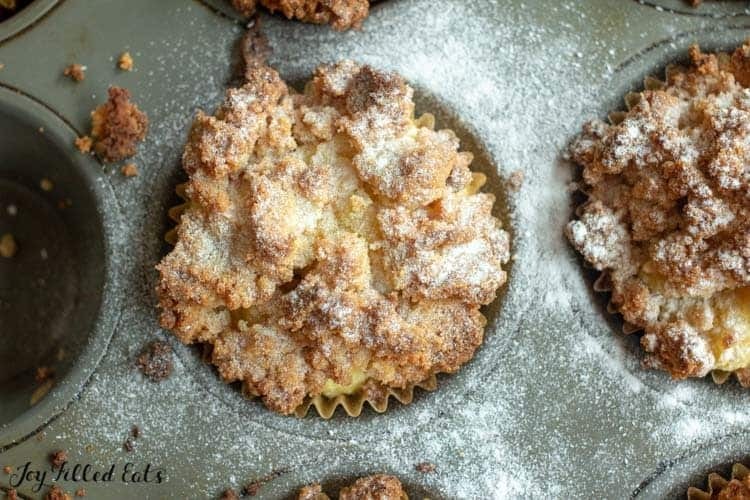 Coffee Cake Muffins are a delicious breakfast dessert or afternoon snack. 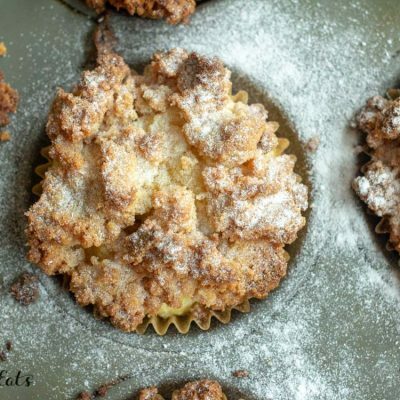 These will tickle your taste buds any time of day with cinnamon and butter crumbs. Preheat oven to 350. Line a standard muffin tin with paper liners and spray with cooking spray. 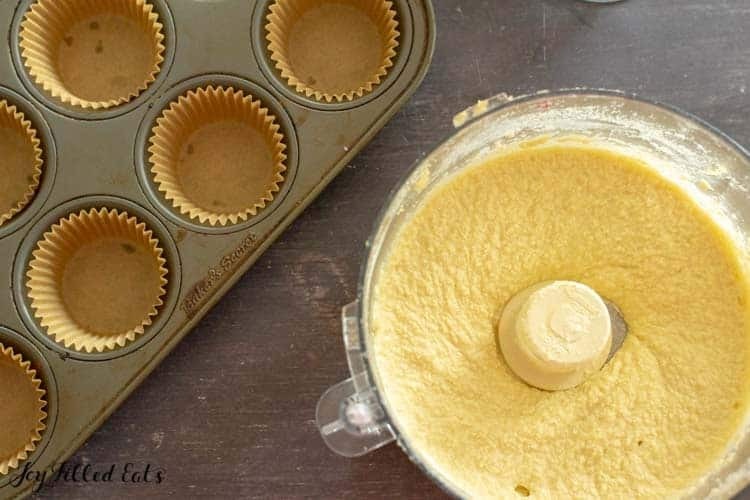 In a food processor combine all the batter ingredients. Mix thoroughly. Divide between the prepared muffin tin. Combine topping ingredients in the food processor and pulse until crumbs form. Sprinkle on top of the batter. Bake 20-25 min until golden. If the crumb topping starts to get too dark cover with foil for the last 5 minutes. *** I get a lot of comments from my low carb readers on the use of molasses. I use it for flavor, not sweetness. One teaspoon of molasses has 5 grams of carbs. This recipe uses 1/2 tsp divided by 12 servings. That is less than .25 grams of carbs from the molasses. If you prefer you can just omit it. Amazing Taryn! Thank you! I have followed your recipe EXACTLY (and I mean EXACTLY) as written TWICE ALREADY this week... ha. I used 'Pure Via Sweet Granules' (stevia leaf and erythritol), and organic coconut flour by 'The Groovy Food Co.' ---- I used the store brand organic butter and cream cheese and almond meal -- Sainsbury's - I'm in London. Thanks again. The BEST low carb treat I’ve made to date!!! Thanks for helping me feel like Keto doesn’t have to be so bad!!! This recipe used a lot of my “expensive” ingredients and I was a little nervous about it but I am so glad I made these muffins anyway, worth every bit of almond, coconut and monk sweetener!! Thank you again!! I have made these several times and love them. Today I was lazy and didn’t want to make the topping so just sprinkled with Swerve brown sugar and sprinkled with your healthy granola that I always keep on hand. And yum... they turned out great!!! Thanks for your recipes. These ingredients are expensive and I always know your recipes will turn out and won’t waste them. I am a registered dietitian and recommend your site often. This is, by far, THE most delicious muffin ever! I used 1 teaspoon vanilla and 1 teaspoon almond extract to the batter and added sliced almonds to the crumb! The texture is perfect. The taste is perfect. This will be my go to recipe! I just found this recipe and wanted to try it! just popped then in the oven and cant wait for the timer go off. I twisted a little by adding spices to the batter such as clove, cinnamon and cardamom. I know I'm bad at behaving when it comes to follow recipes:))). I read some comments and wanted to say that my topping was not dry at all. I think it was just the right consistency. It's been 8 weeks that got on Keto diet for digestive problems and I've learned so much during this time discovering new way of baking and using different ingredients and sweeteners, nut flours. I use stevia and 100% natural Erythritol. After so much research i found out that these and also Monk fruit are the best sweeteners for your body! Hey, Thank you for coffee recipe, I really really like the way you explained it, Me and my family this coffee so i’m going to try this one in upcoming weekend where we set together once in a week so this will be amazing. Taryn, I didn't read all of the comments so someone else may have already made this point. I use my food processor much more than my stand mixer for a lot of reasons but mostly because they are so versatile. The point I want to make is that early on in learning to use my food processor I learned to read through my recipe and turn around the order of how I do things. And I ALWAYS use my food processor for coffee cake. The turning things around part is that I do the streusel first and set it aside in a dish. Then I put all of the cake ingredients (except the fruit if using fruit) into the bowl and process away. Of course when using fruit I do dirty one more dish because I empty it into a larger dish to fold in the fruit. But, I'm not as concerned about dishes (they do go in the dishwasher after all) as I am about making it fast and simple. Just a thought... I have a couple coworkers who are gluten free so I'm going to make this for them along with another regular so that everyone can have some! Holy low carb! These are nothing short of amazing! Made these for a sub dessert for a crab feed tonight and NO ONE could tell they were low carb. Only thing I changed was the sugar sub and added some blueberries. I doubled and used 1/2 Swerve 1/2 Sukrin Gold. Super moist (so hard to do low-carb) and sweet n buttery! We loved!!!!! I make them, using powdered Stevia. I love them. My husband said they were delicious and he loves sweets! I didn’t change a thing. Used Kerry Gold butter. I just have to make sure I don’t eat too many. 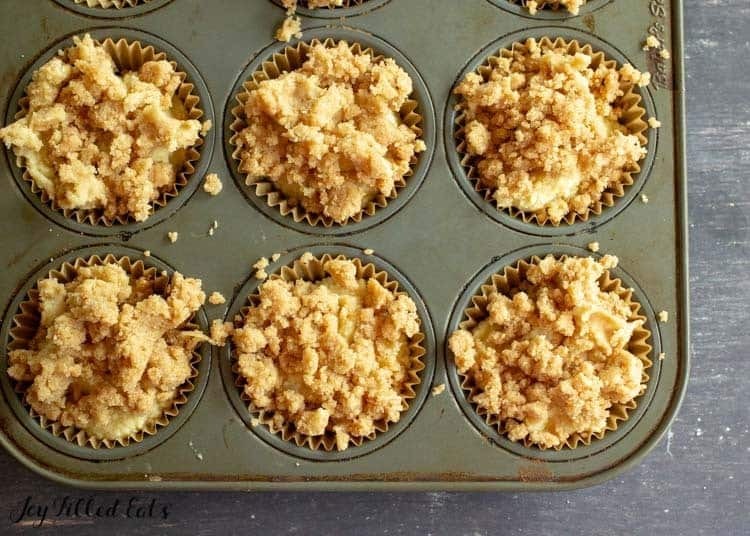 The recipe is perfect for 12 muffins. Barb- how much powdered stevia did you use? These were very tasty but a little dry. How can this be remedied? It's on my to do list to test this recipe with different coconut flours and with all almond flour. I think the brand of coconut flour may be making them dry for some people while others are giving great reviews. I might try adding a little coconut oil as well. I used Bob's Red Mill Coconut Flour and mine were very moist. I used Pyure and I think that half f the sweetener amount was not quite sweet enough for me, but these were definitely delicious. I am going to try adding blueberries as one poster suggested or maybe a cinnamon swirl to the batter because I just felt like it could use "something" else in it. This is definitely a great recipe and can be adapted to a variety of different tastes by just adding a few tweaks. I will definitely make these on a regular basis. Crumb topping did not stick together. It was more like sand on top. Muffins were very dry. I threw out all but 3 which I ate with a ton of butter to make it edible. Hi Matthew, I'm sorry you found them dry. They should not be. Did you make any ingredient substitutions? I am always happy to help troubleshoot if a recipe does not come out as expected. GREAT RECIPE!, LOVE COFFEE CAKE. I’ve noticed that when I’m baking with on plan sweeteners that my cakes and other desserts come out tasting like I used zero sweetener. I always follow the recipes to a T. Any suggestions on what I can do? I'm not sure why that would happen. The sweeteners I use always sweeten my baked goods. Which sweeteners have you tried? You may just need some time getting used to alternative sweeteners. I never really had too many sweets before I started THM, so the transition hasn’t been that difficult. I’m using NOW brand of Xylitol and Erythritol and a pure Stevia. I've used those and they work fine. To be honest, I think it's your tastebuds. You can always increase the sweetener in my recipes. Can you use just Truvia for the sweetner? If so, what amount? Truvia should work. It would be the same amount. Great recipe. Made this today and they have a great crumb. Remind me of little debbie or similar coffee cake muffins. I did find that the topping was very dry and some just fell off in hunks because it was fairly solid. I do plan on making them again but will follow your suggestion and use less coconut flour. I will also add more butter as it will help moisture and should help carry the flavor better. I just made these tonight & they are amazing! My 4 year old loved them too. Thanks for the recipe! Can I use regular Stevia instead of this sweetener? I'm not sure pure stevia would work because it lacks the bulk of granulated sweeteners. Or do you mean a blend like Truvia? I have Stevia in the Raw. It says its Stevia blended with other sweeteners. I also have coconut sugar? I'm very new to keto so I'm still trying to get it all figured out. Stevia in the Raw is 1:1 for sugar. My sweetener is 1:2 for sugar. So you will need 1.5 to 2 times the amount listed to get the same sweetness. I haven't tried this with stevia in the raw but it should work. Can I use honey instead of the sweetener? If so, how much? Possibly in the muffins, not in the topping. But, I have not tested this with honey. You would need 1.5 to 2 times the amount so reduce one of the other liquids if you try it. I am allergic to dairy and I'm wondering if there is something else I can substitute for the cream cheese? These sound delicious and all the comments seem to confirm that, but I'd need something else for the dairy. I hope someone has a suggestion. Coconut cream should work in place of the cream cheese. You can buy little cans of it or refrigerate a regular can of coconut milk and just use the solid part once it separates. Do these have to on ne stored in the fridge? I want to make these, but I don’t have any space to store the, event the refrigerator as my parents have a lot of unnecessary items. They should be fine at room temperature for 2-3 days. Thanks so much for this great recipe. I had a meet and greet event at church on Sunday between first and second services. SO, I made 2 recipes and added frozen blueberries to one and topped with powdered THM friendly gentle sweet (using your recipe) and the other I added about 2/3 cup of canned pumpkin and about 1/2 tsp each of cinnamon, ginger and nutmeg then topped these with cinnamon powdered sweetener. I think your recipe is great--looks so pretty and is very tasty. Even though there were 2 very long tables of desserts and mine were identified as sugar free and gluten free ALL of them were eaten. I also took some off plan muffins that were very nice but all of them were not eaten. GOOD RECIPE. Thanks so much for sharing. I will make it again. These were delicious!!! Thank you for the recipe! 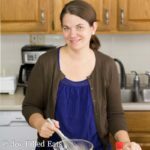 Can I use heavy whipping cream instead of almond milk? Does this freeze well? If so how long? I think these would freeze well for 2-3 months. I have not frozen this particular recipe but my other cakes and muffins do freeze well. Probably, but I have not tested this with Briana's baking mix. I prefer almond flour for the crumbs than baking mixes in general. Can you use all coconut flour instead of the almond flour? I don't think so. Sorry! These are so pretty and taste amazing! how much of each item do you use for your sweetener? for the batter and topping. Sorry, I just make it in big batches and use as needed. The recipe is here: joyfilledeats.com/sweetener You can half it to make a smaller batch. Yes, you can use all almond flour. If the batter seems too wet add a little more. Coconut flour is more absorbent. What would be the substitution if using THM Baking Blend? You can use baking blend for the muffin base (use a little less) but almond flour works better for the topping. Yup! The recipe I based this on (my Almond Crumb Cake) is baked in an 8x8. I love a generous amount of crumbs 😀 I just pile them high.